Long-term care can be an emotionally charged topic. After all, no one wants to think about themselves or their loved ones being incapable of living on their own. But if you want to make a smart financial decision and protect your nest egg, long-term care insurance is a must. Take Joe and Susie, for example. They weren’t always smart with money, but they worked hard and built up a nest egg of $300,000. When Joe was 67 years old, he developed Alzheimer’s disease. At first, it wasn’t too bad. Susie used some of their nest egg to hire a homecare specialist to help with Joe a few hours every day. But as his condition worsened, Joe had to go into a nursing home. Sadly, after five years in the home, Joe passed away. Susie, now 72, is healthy as can be for her age, but she has to work full time because her husband’s stay in the nursing home devoured most of their nest egg. Joe and Susie’s story is not unique; it happens to many people every year. However, with long-term care insurance in place, you can keep it from happening to you. Finding an independent insurance broker who will shop several different long-term care companies and get you quotes can save you thousands of dollars and loads of unnecessary worries. Most health and disability insurances won’t cover long-term care, but long-term care insurance will. The Alzheimer’s Association estimated end-of-life care costs in 2016 were between $217,820 and $341,651. Simply put, long-term care is expensive. What Does Long-Term Care Insurance Cover? Side note: It’s common for people to try to cheat the system by moving assets out of their parent’s name to get the government to pay for LTC. That is considered fraud—a federal crime—and the government will prosecute you. The government is already having trouble paying for those on Medicaid. Do you really want to count on the government to pay for your long-term care? No way! The median cost of a semiprivate nursing home room nationwide is $85,775 per year, according to Genworth’s 2017 Cost of Care Survey. Assisted living runs $45,000 annually, and home health aides charge $135 per day. (4) Traditional long-term care insurance ensures that no matter where you need care, you’ll have the money to cover at least a portion of the bill. A lengthy stay at a nursing home is less likely to drain your savings or wipe out your estate. According to a LifePlans, Inc. survey, the average annual long-term care insurance premium is $2,727. That provides a benefit of $161 per day for nursing home care for a set number of years (four is most common). (5) Even better, you can include an inflation rider that increases your daily benefit over time, typically by 3% a year. The policy is triggered when you can no longer perform two out of six activities of daily living such as dressing, bathing, eating, transferring to a wheelchair, etc., or suffer from severe cognitive impairment. Benefits start after a waiting period of 30–90 days. Another increasingly popular option is a policy that combines life insurance with long-term care coverage. With a hybrid policy, you can access the death benefit, the money that your beneficiaries would receive in the event of your death, while you are still alive to pay for long-term care. And if you end up not needing care, your heirs get the full payout. Rates are considered “noncancellable,” which means premiums are fixed for life (and often paid all at once up front). Hybrid policies should be a last resort and only used if you can’t qualify for a traditional long-term care insurance policy due to medical underwriting. A single premium means you’ll have to come up with tens of thousands of dollars at once which is money you could have otherwise invested for retirement. You may also be buying life insurance you don’t need. And, unlike traditional long-term care insurance, the premiums for hybrid policies are not tax-deductible. Similar to whole life insurance, the biggest risk of these hybrid policies is that you could forego thousands of dollars in potential earnings on your investment. The policies don’t guarantee that you’ll earn market rates; the benefit paid is only the face value of the policy. Those lost earnings could end up making hybrids the most expensive long-term care policy of all. You may assume that you’ll pay less if you buy your policy at age 50 and lock in a lower monthly premium instead of waiting until age 60 as Dave recommends. But Dave will never tell you to buy something based on how much the monthly payment is. That’s what broke people do, right? 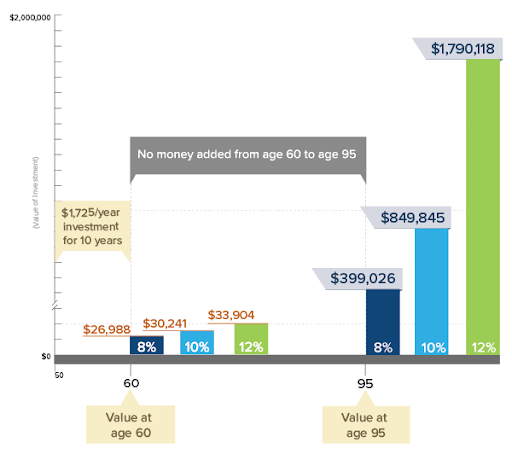 You can already see how buying at age 60 is a slightly better deal. But what would happen if, instead of buying LTC at age 50, you invest that $1,725 each year until age 60? You could have over $30,000! If you keep that money invested until age 95 and never add anything to it, you could potentially have over $850,000! That’s not too shabby! Many people worry that if they wait until age 60 to buy LTC, they will develop a medical condition that will either prevent them from qualifying for coverage or significantly raise their premiums. If you have a family history of illness at a young age, or you are losing sleep because you’re worried about getting sick and not being able to afford care, then buy LTC when you can afford it. The peace of mind is worth more than any cash you’ll save on premiums. Just don’t buy LTC at a young age because you think you’ll save money by doing it. As you can see above, that’s just not true. LifeGuide Financial Advisors, LLC ("LifeGuide Financial") is a Registered Investment Advisor ("RIA"), located in the Commonwealth of Pennsylvania. LifeGuide Financial provides investment advisory and related services for clients nationally. LifeGuide Financial will maintain all applicable registration and licenses as required by the various states in which LifeGuide Financial conducts business, as applicable. LifeGuide Financial renders individualized responses to persons in a particular state only after complying with all regulatory requirements, or pursuant to an applicable state exemption or exclusion. We primarily serve clients in Mechanicsburg, Camp Hill, Carlisle, Mt. Holly, Lancaster, Elizabethtown, Ephrata, York, Hershey, Dillsburg, Boiling Springs, Newville, Newburg, Chambersburg, Shippensburg, Gettysburg, Hanover, Duncannon, Harrisburg, Linglestown, New Cumberland, Lebanon, Mount Joy, and Middletown. Click here for important disclosure information. What is important to talk about?